Set in 1800 South Carolina, this serial anthology follows the romantic adventure of Miss Celia Sheldon. Excerpts written by . 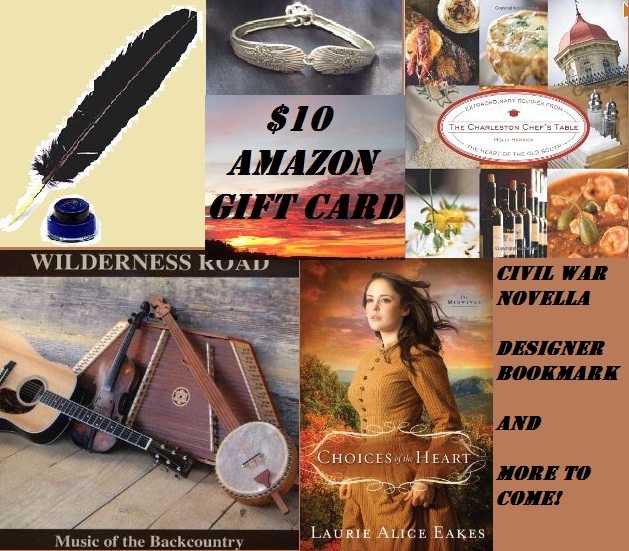 . .
Click HERE for a list of our giveaways. Turner yanked Celia into his arms as an explosion of sound tore through the forest. She nestled closer, her slender hands clasped around the lapels of his waist coat in a death grip, her face buried in the safety of his neck, her warm breath sending shivers of awareness skating down his spine. Her bonnet had fallen back, the ribbons knotted loosely at her neck, a riot of honeyed curls falling in waves around her shoulders. He tightened his arms around her, resting his cheek against her hair, filling his lungs with the scent of her. Movement beside Turner made him glance up. The blast from Elijah’s shotgun had left the woods shrouded in a fog of gunpowder, the biting odor stinging his eyes and nose, making him cough. Through the haze, Turner could just make out the shadow of Celia’s servant walking toward Gaskins, then leaning over to pick something off the ground. A soft thud fell against the damp leaves. Elijah and the pastor both reached the man at the same time, wrestling him to the ground. Over to the side, his cousin William was taking full advantage of Miss Mabel’s fright, his arms around her, whispering inaudible words against her ear. Whatever intentions William may have had for Celia had quickly vanished, replaced by his fear of losing the woman in his arms. Turner frowned. How would Celia take being thrown over for an upstart? Taking her arm, he led her away from the others, but close enough to guard her reputation. The evening breeze blew softly through the water oaks, the lacy tendrils of Spanish moss dancing on the wind, the warm musky scent of the rising tide more pungent than just moments before. He turned to face her, once again caught off guard by his reaction to her beauty. True, Celia Sheldon was lovely but there was something more, a resolve that hid her vulnerability. He fought the urge to take her in his arms again. Celia hesitated for a moment then nodded. “I very much like that vow,” she whispered, leaning toward him, her eyes a sliver of vivid blue peeking from under a fringe of dark lashes. She moved closer, lifting her lips in an unspoken invitation. He couldn’t deny himself this one kiss any more than he could forget to take in his next breath of air. Turner lowered his head, gently brushing his mouth against hers before settling his lips against hers. She lifted her arms and wrapped them around his neck, burying her fingers into his hair, bringing him closer. He tightened his hold of her, a feminine bundle of silk and lace in his embrace. Never in all of his days would he forget this moment, when he fell in love with Celia Sheldon. They both jumped, the word exploding on the air like a bullet out of old Elijah’s shotgun. But the man coming toward them was a great deal older, regal. A gentleman by all accounts right down to the double barrel pistol aimed at Turner’s chest. He shoved Celia behind him, ready to take a bullet rather than have even one hair on her lovely head put in harm’s way. 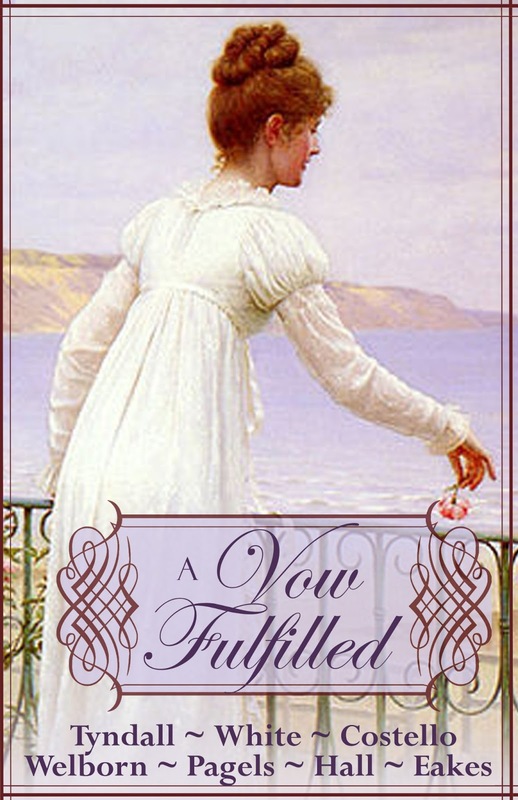 Tomorrow concludes A VOW FULFILLED and our fun blog hop. 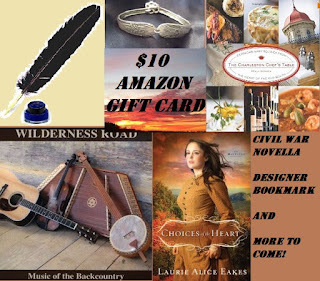 Chapter Seven will be hosted by Debby Lynne Costello's blog, Sword and Spirit, hosts Laurie Alice Eakes. SERIOUS QUESTION OF THE DAY:: Celia made a rather flippant vow about who she would marry. Have you ever made a vow and regretted it? What made you break that agreement you'd made? Or did you stick with your vow despite the consequences? NON-SERIOUS QUESTION OF THE DAY:: Ack! How do you think Celia is going to get out of this pickle? Or will she? And don't forget our giveaways . . . so leave a comment! Gosh, how can you stop here?? I have to wait 24 hours to find out what happens next?! Just lovely, Patty! Ooooh, the kiss. Made my morning. Oh Gina, if that's a pickle she's in, then I truly love pickles! I've loved this serial and look forward to the tie-up but will miss the anticipation. I can't remember making any vows flippantly but I've broken one that was serious. TO OUR VISITORS -- Welcome to the Inkwell. We're thrilled to have you here and hope you visit again now that you know where we are. Hello again. Absolutely loved Chapter 6 ... the excitement and suspense are leaving us wanting more ! As to vows -- all I can say is, that I "try" my very best: "to be a person who says what she means, and, means what she says". Can hardly wait for Chapter 7 ! Thank you for joining us for Part 6. Patty is a talented author and a dear friend. All these ladies are talented authors and dear friends and sisters in Christ. I've had a wonderful time working with them. Thank you all for participating with our fun expedition. Making vows flippanty...does marrying someone I knew for two months count? Maybe we shouldn't go there. LOL. Loving the story!!!! So glad it came to the Inkwell today. Love the excitement through this chapter! Very much anxious to see what is going to happen in the final chapter! This is such a neat idea! Can't wait for the conclusion tomorrow! Oh it just gets better and better!! I do believe Celia has met the man of her dreams. I don't remember a vow I've ever made flippantly. The only vow I can remember is the one I gave my husband 10 years ago and I plan to never break it! I think Celia will marry Turner. They are wonderful together. By the end of the story, it will probably be the best pickly Celia's ever been in :). ps. I hope y'all continue writing stories together like this! I'm so sad it ends tomorrow but excited to see what will happen! Oh this just gets better & better. Well as I said before I don't like snakes so I an proud it turned out good.. Hoping that Celia will marry Turner. I hope turner gets the ring back. Maybe gives to Celia .As far as making vows & keeping them , I try to do just that keep them.. I am enjoying this short story story very much . Ohhhh can't wait till tomorrow. OH Celia...just give up and marry the handsome stranger!! If he'll take a bullet for you - I'm sure you'll be able to work things out! As a young parent, I heard a child care expert say on one of those talk shows that you shouldn't threaten your kids with something you can't carry out or they'll know your words don't have weight. So when I hear a parent say, "Be home by midnight or I'll rip your head off," that makes me cringe. And not just for the image it presents. Someone else might say it's only a term for 'you'll be punished', but kids need to know what the punishment will be before they do the crime. It helps them weigh the consequences and decide if it's worth the risk. So when the kid breaks curfew, how can the parent carry out their flippant vow of ripping the kid's head off? They can't. And it's not fair to put another punishment on the kid - like grounding, no TV, taking away electronics - because that wasn't the promised punishment. Learning that helped me place reasonable demands on my kids, and they grew up knowing exactly what the rules were, as well as the punishment for breaking them. My most memorable experience with this however, was when Crystal was 5 yrs old, and I was tired of her colouring on the walls. Keeping in mind what the child care expert had said, I drew up a list, taped it to the fridge at Crystal's eye-level, and explained to her the punishment for each crime, some of which she'd already pulled off, others I imagined she might be contemplating. Several days later, I found her staring at the list and wondered how much of it she could actually read. She finally yelled out, "What's the punishment for writing on the walls?" I'm glad to say, she never wrote on the walls again. But 2 days later I had to add, 'colouring on the furniture' to the list. Ladies, thanks for visiting our blog, reading the story, and leaving a comment. Dina, I was engaged to hubby longer than we dated. And most of our 6mth engagement, he lived in Texas. Vows . . . The verbal ones aren't as much an issue for me as unspoken agreements. I remember when I was in 3rd grade, after my parents told us we had to go to Girls in Action (which I hated back then), I vowed when I was a parent, I would never make my kids go to church or anything that they didn't want to do. I've broken that vow. But I've also been less dictatorshipish about forcing my kids to do things they didn't want to without talking to them about why they didn't want to go. I've also made vows such as "i'm never going to let so-and-so break my heart again." We can spend so much time protecting our hearts from pain that we harden our hearts to love. Tomorrow Laurie Alice Eakes brings the conclusion to the serial story. It's fitting . . . and probably not something you'd guess. Oh such fun - pistols at dawn! I am royally enjoying the twists and turns in this story! You ladies really should put together a book! What a story. Can't wait for the conclusion. Sad it will be over. Patty, this was great!!! I am amazed how you ladies continue on with this story without missing a beat. I can't wait for the last chapter.....yet, it will be sad as well. God bless! So glad the serial story has finally made it to the Inkwell! Such a gifted group of writers and a great story! Anita, I am cracking up over that story with your daughter. Well, I'm afraid I made a vow I didn't keep. When I was about nineteen and thoroughly disgusted with my latest boyfriend, I declared I would never get married. . .
Great story! Oh, the suspense! Nice job, Patty. Gina and Dina, I was engaged longer than I dated my husband, too. Don't fight it, Celia! Sign the paper. Serious: Amos 3:3 Can two walk together, except they are agreed? Non-Serious: When my husband was in the service he told me he heard Cross over the Bridge by Patti Page ~ he thought the one line was, "leave your pickle patch behind you," which he had done from their farm. I don't think Celia is in a pickle ~ I hope she finds out it isn't dill but sweet ~ she will relish Turner! Hi everyone! I've had a blast doing this with my friends--we'll have to do this again real soon! As far as vows go, I've broken one--like Celia, I promised to marry a man then backed out when I realized I couldn't see us lasting a lifetime together. I don't like breaking promises, but in this case, it was better than a broken marriage. I proposed to my husband of 30 years on our very first date--I KNEW he was the one for me, and he still is. Only man who can still make me belly-laugh! And he's a red-head which I have a serious thing for! Oh wow! I thought Elijah really had shot Gaskins! I absolutely believe that they will get married tomorrow :) After all, it is a romance, and the name is A Vow Fulfilled... Lol. Can't wait to read the last chapter!! I LOVE this so much!!!!!!!!!! I can't wait for tomorrow's chapter, but I'm sad it will end! I have enjoyed this. I am loving this so much and hate for it to end. I probably won't win a prize, but this has been exciting. I am a follower of OWG and love it. I try to keep my promises and definitely my vows. I hope this great couple gets married! I am so enjoying this story! Thank you authors! Love the comments! I've made quite a fee flippant vows to my kids. Noy proud to admit that. Nor that I didn't keep those vows. Such as "you two stop yelling at each other or I'll cut your tongues out!" funny thing is they both stopped yelling at each other and said "thats not funny, mom." I think Celia will marry Turner and be very glad she did! This is such a fun story; it kind of reminds me of a really old movie, a melodrama. Only with the Lord's help am I able to keep commitments. Hmm, Celia is in a rather tasty pickle:-) By your leave, I do hope she marries Turner. Anticipating the last installment! Ooh my, your leaving us in wonton need of seeing this resolved in a happier than it began kind of way! I am most certain that Celia will have a clear head come the morrow, and sign with a quill to complete the marriage with Turner! At this point, you'd have to surely pity her the complete fool, after he showed her every ounce of what she'd hope to find in a man deemed worthy of marrying! I cannot wait for the finale of this serial! Thank you to each of the writers who penned such a riveting tale! It seems rather poetic that Celia finds herself facing a shotgun wedding after she "shot down" all her previous beaus, often rather frivolously. And I think the papa who has been dragged through all her broken relationships has a right to be steamed enough to force the issue. Looking forward to tomorrow's big finish. What suspense! Can't remember any vows made that I regretted - however, am sure there were some when I was going through that "young & foolish" stage. Thanks for the opportunity to enter the drawing. This has been so much fun & all of you ladies have done such a great job of taking what was given and running with it. A sign of very creative & great authors & I can't wait to read the last chapter of this story. I don't remember making that sort of a vow, but I've said things that I wished I hadn't. Sometimes we speak first and think later--regrettably. I was sick yesterday, but glad I could find this post today. 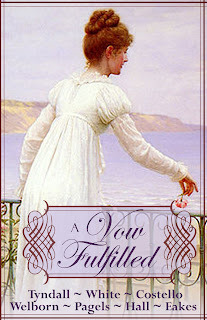 I so enjoyed reading Patty's section when I got my copy of "A Vow Fulfilled." And now we have Laurie Alice's to finish it out!!! I loved reading this chapter with that kiss from Turner... a perfect moment beautifully written! Truth be told I don't think she'd care that much to get out of this pickle... although I'm sure she'd like Turner to propose of his own violition! Silly comments can come with serious repercussions. i love that both Turner and Celia made vows that seemed more like comments! Hurrying along now to read the rest! Thanks! No, never made a vow that I recall that I broke. But who knows? Anyway, this story sure moves rapidly. Perhaps that is the way with co-authored serials. I've not made a vow though my husband - when he makes a gentlemen's agreement - he sticks to his end though many at the other end of the handshake didn't keep their end of the deal. I'm always ready to challenge but he says a Christian keeps his end regardless. She's going to marry him! I'm very careful about making vows. Fortunately by God's grace my husband and I have kept our wedding vows! And I think Celia and Turner will keep theirs as well!